Lars Rasmussen and Tom Stocky are a pair of Google alumni who worked on search products during their tenure with the search giant. In 2011, they moved over to Facebook, where they began work on a “new kind” of search product. 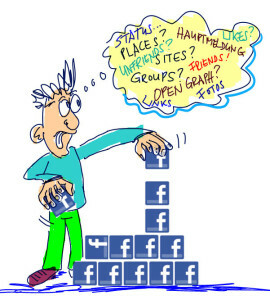 Now the veil of secrecy has been pulled aside to reveal Facebook Graph Search. Like with almost any announcement by Facebook, there are already some serious questions and concerns being raised. Both privacy advocates and online marketers are paying close attention, as is Google itself. Think about the sheer volume of information out there. Organizing it into a visual search that accepts natural language is an almost grail-like goal. As that info becomes organized, there will always be the inevitable backlash as the public realizes they have shared far more than they think they have. Of course, the opt-out is always an option, isn’t it? Not really. Facebook cited a stat that only a single-digit percentage of its users (which amounts to tens of millions of people) had previously opted out of having their content appear in search results, so the change wouldn’t be noticed by most. Of course at the time, no one knew the future of Facebook’s advertising business might ride on their data appearing in search results. Facebook has a well-earned reputation for playing fast and loose with personal data. The company also have a long-standing rep for using an opt-out approach, something that I personally find to be unethical. Most people have little to no idea where their security settings are or how they work, making the opt-out process opaque and hard to access. In this case, “hard to access” has become “can’t do that here,” which I think show how desperate Facebook is to prove revenue potential to investors. The gold standard for modern Internet endeavors is opt-in, the approach used by Google +. Of course, allowing people to opt-in produces far less participation than just adding everyone right off the bat. On the flip side, opt-in produces an engaged and attentive audience, whereas opt-out usually ends up producing hordes of “zombie likes” that have little to no impact on actual engagement. If Facebook were an email list, it would be blocked by most ISPs as spammers based on this tactic alone. Think of it like Google hacking on steroids. Attackers learned long ago that Google is a virtually endless treasure trove of valuable information — sensitive data, and seemingly innocuous tidbits that can be used to hack into a network or account. Facebook Graph Search raises the bar — and not in a good way — by delivering that same capability with a more personal context. This make you wonder if we are going to see Facebook flame out like MySpace did a few years ago. As the news articles about Facebook playing fast and loose with people’s private data accumulate, and the user interface continues to radically change, users are slowly but surely reaching a critical mass of dissatisfaction. Just look at Mark Cuban’s decision to completely de-emphasize Facebook for his football team and all of his Fortune 500 companies. While there is always a chance that this may prove to be an amazing tool for marketers, and a second wind for Facebook, it is my belief that the company’s disrespect for its users will be its undoing. What are your thoughts on the new graph search?